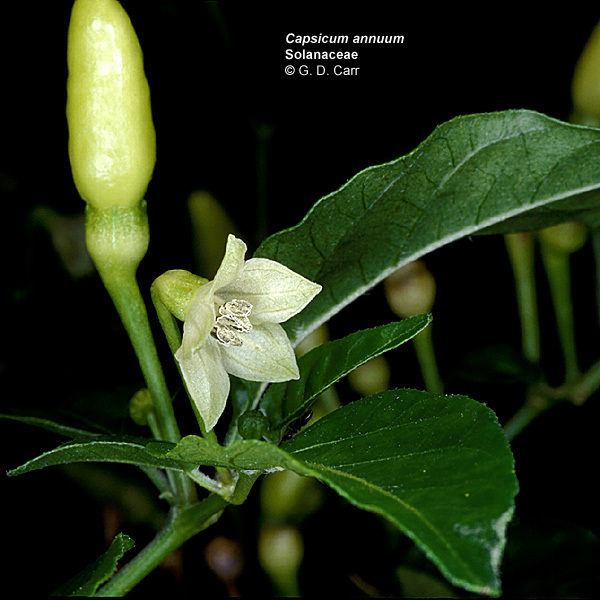 Solanales. 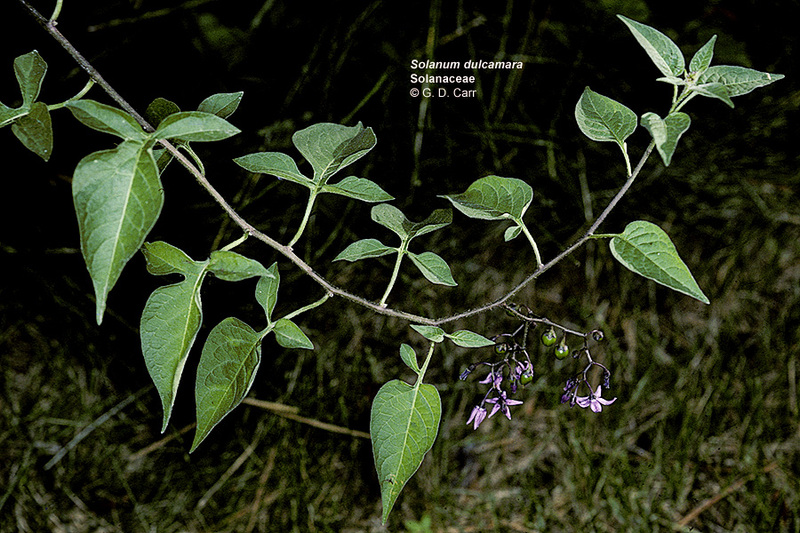 The Solanaceae are herbs, shrubs, or trees comprising about 85 genera and 2,800 species that are frequently lianous or creeping. 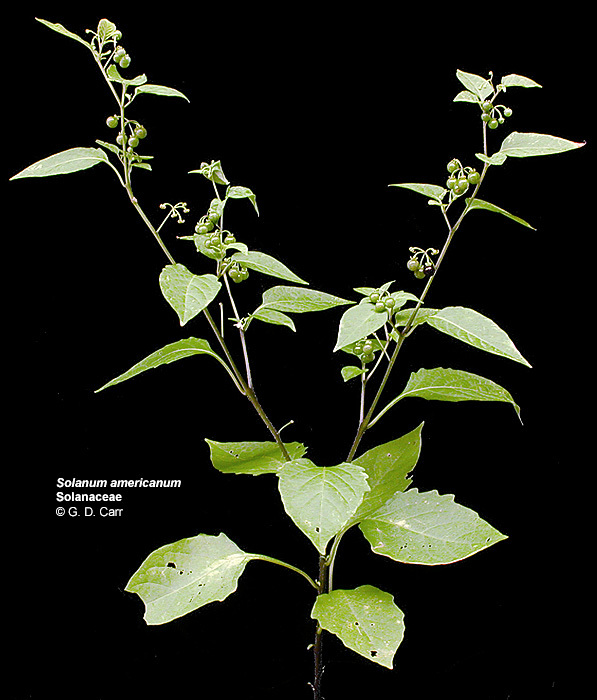 The leaves are alternate, usually simple, and lack stipules. 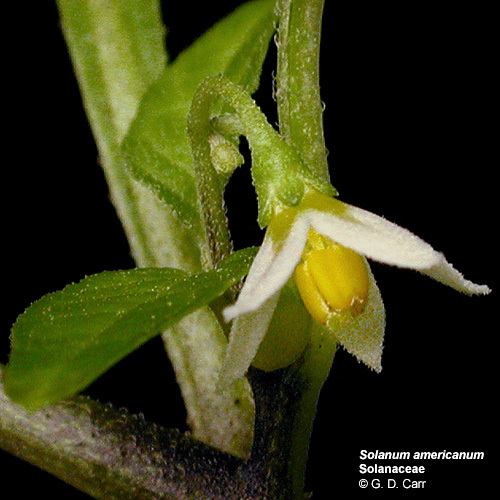 The flowers are bisexual and actinomorphic or only slightly zygomorphic. 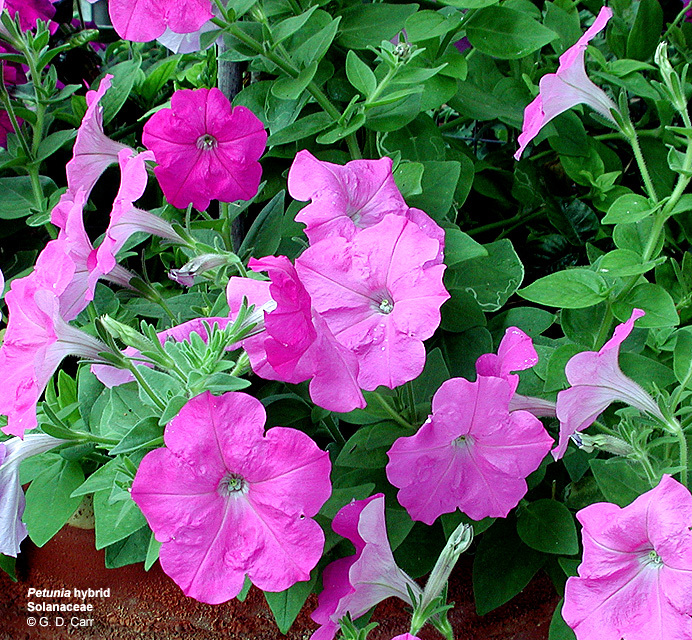 The perianth and androecium whorls generally are isomerous and usually are 5- or sometimes 4- or 6-merous. 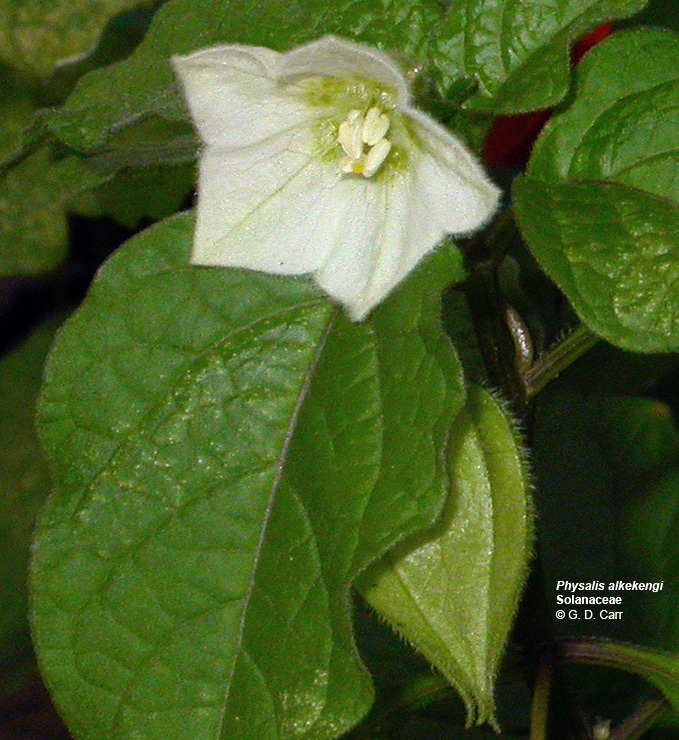 The calyx is synsepalous, ranging from tubular to deeply cleft. 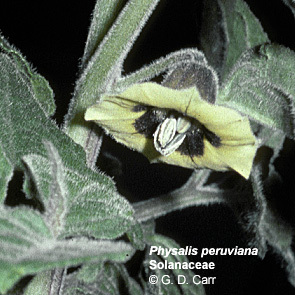 The corolla is sympetalous and ranges from forms with a short tube and rather long, reflexed lobes to forms with a long tube and short lobes. 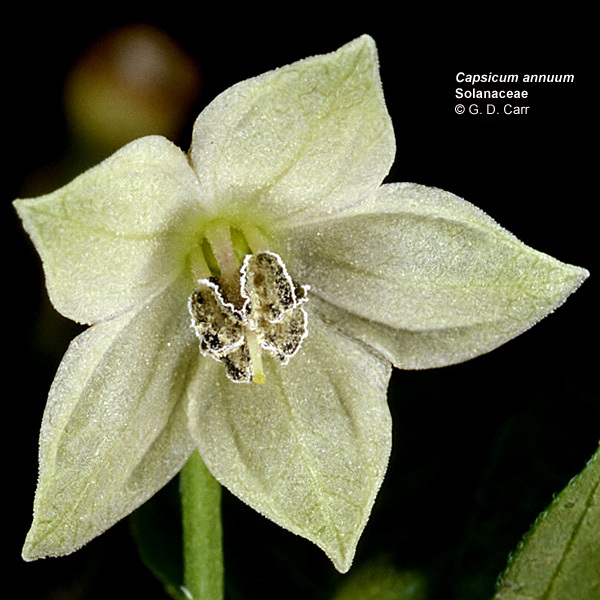 The stamens are distinct, alternating with the lobes of the corolla, and adnate to the corolla tube or perigynous zone. 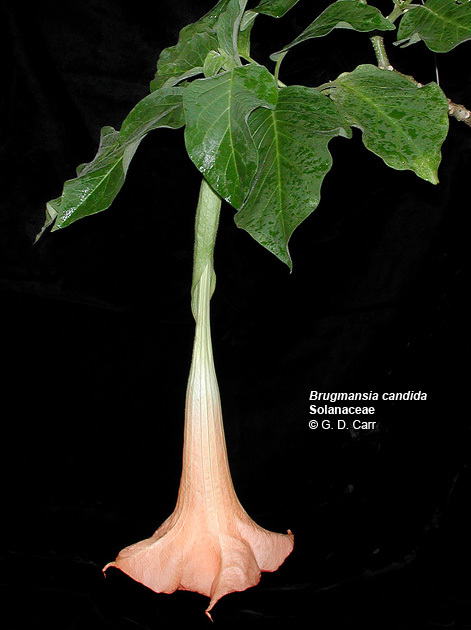 The gynoecium consists of a single compound pistil of 2 carpels, a single style, and a superior ovary with 2 or rarely more locules by false partitioning, each with nearly always numerous axile ovules. 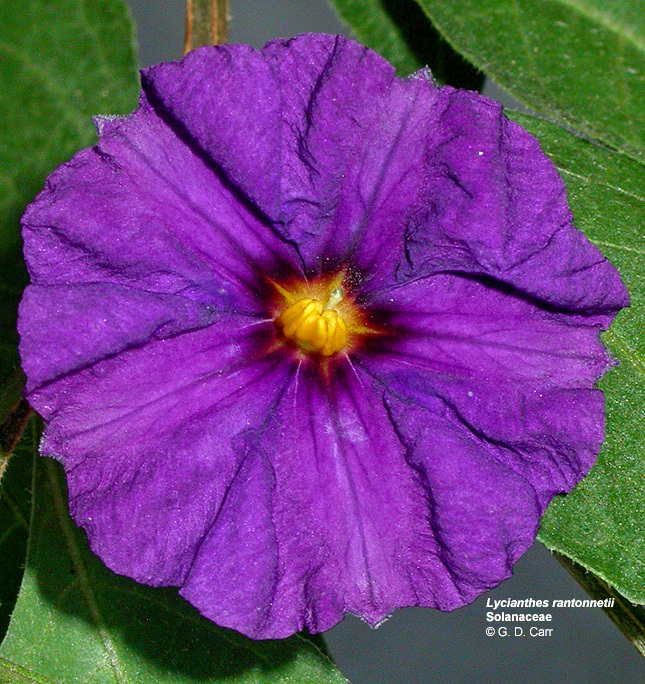 A nectary disk is generally present around the base of the ovary. 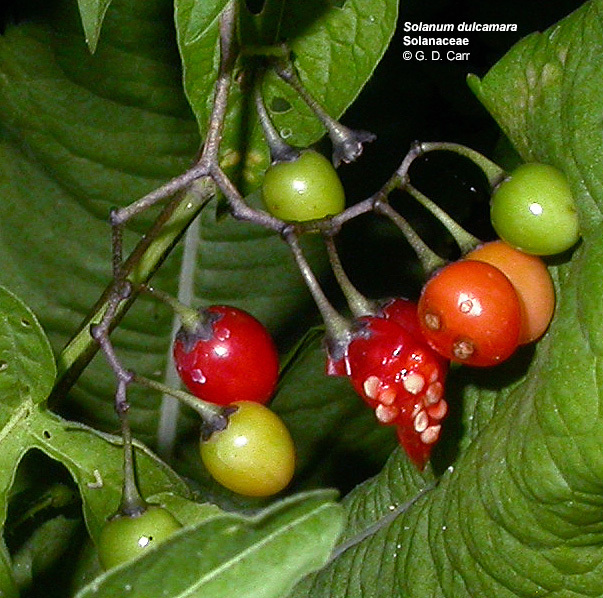 The fruit is a berry or septicidal capsule. 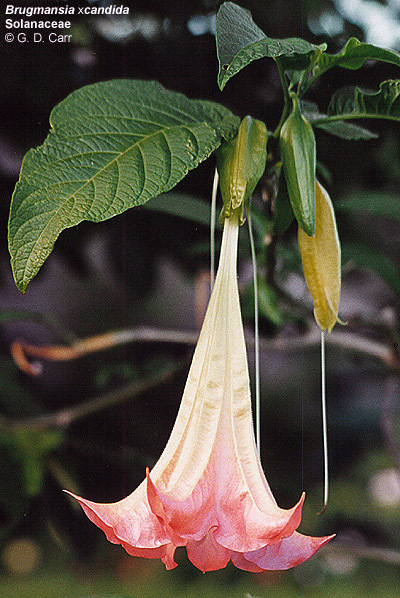 Brugmansia x candida, angel trumpet. 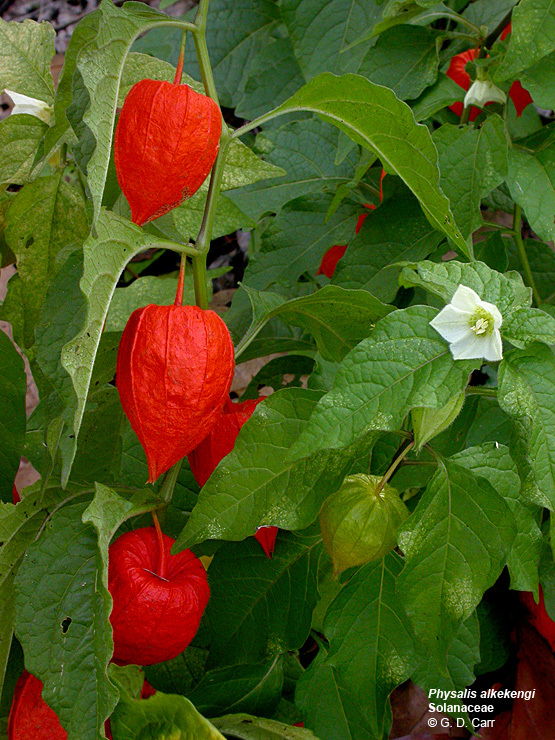 This commonly planted ornamental tree has attractive trumpet-shaped flowers but is quite poisonous. 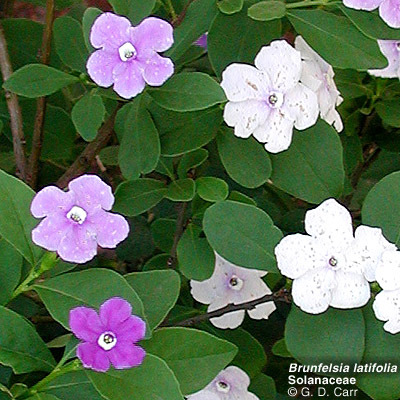 Brunfelsia latifolia, yesterday-today-and-tomorrow, kiss-me-quick. 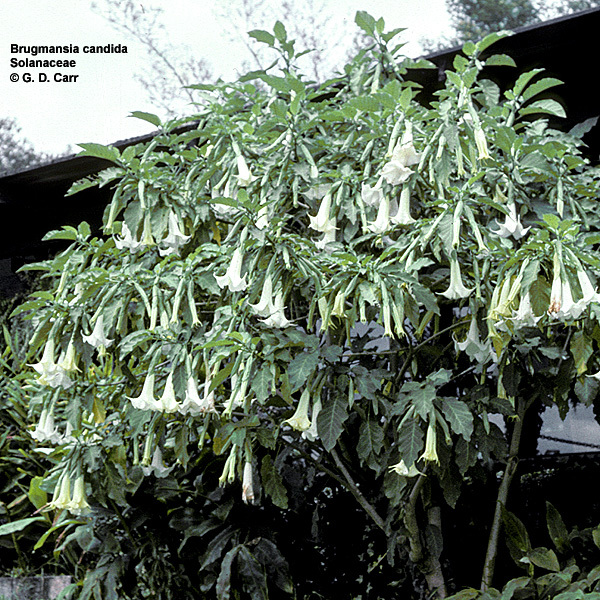 Shrub from tropical America, with fragrant flowers that change from violet to white over a three day period. 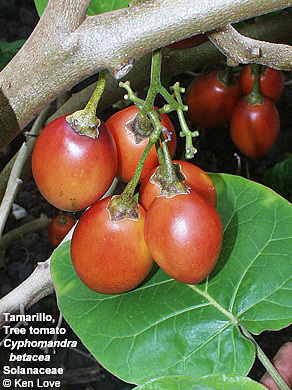 Cyphomandra betacea, tamarillo, tree tomato. 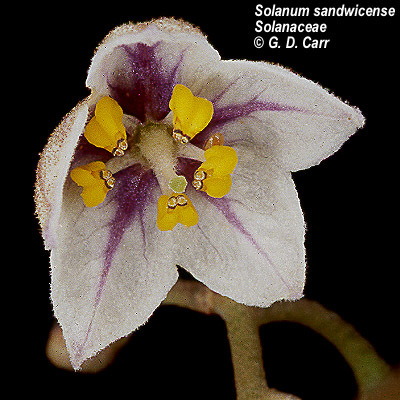 Lycium sandwicense, 'ohelo kai. 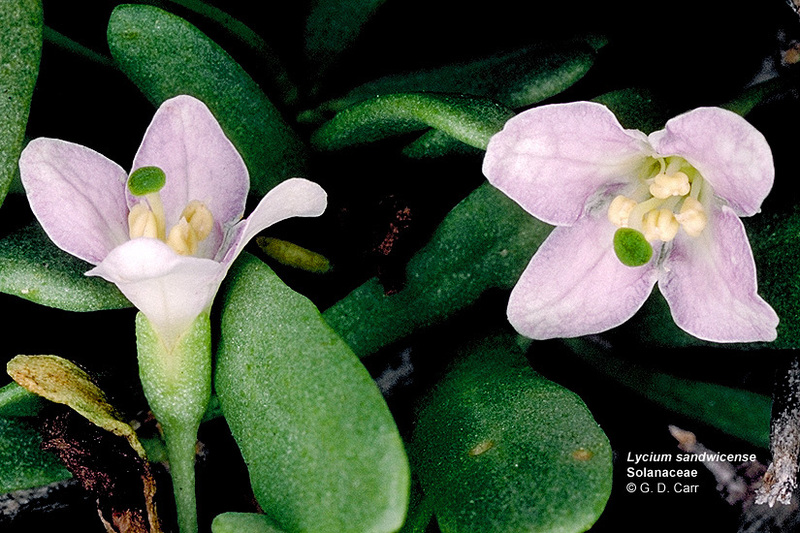 Note the 4-lobed corolla, 4 stamens, and peltate stigma in flowers of this native Hawaiian coastal shrub. 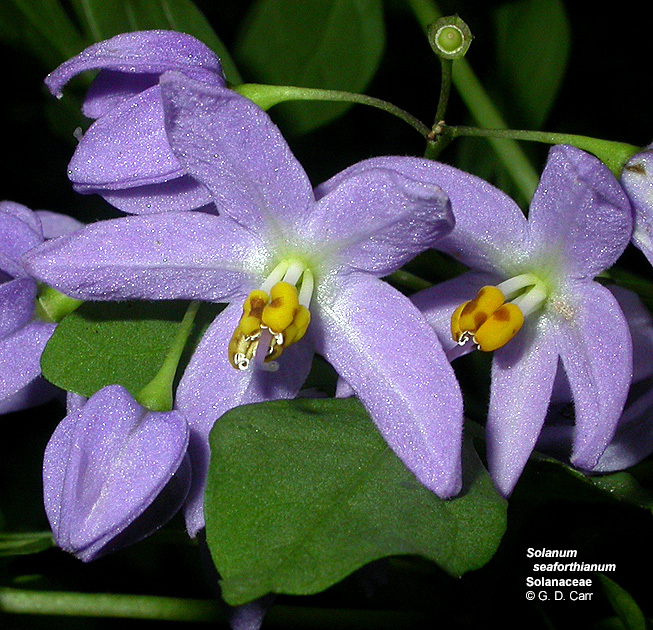 Lycianthes rantonnetii, blue potato bush, Paraguay nightshade, Placentia CA, June, 2003. 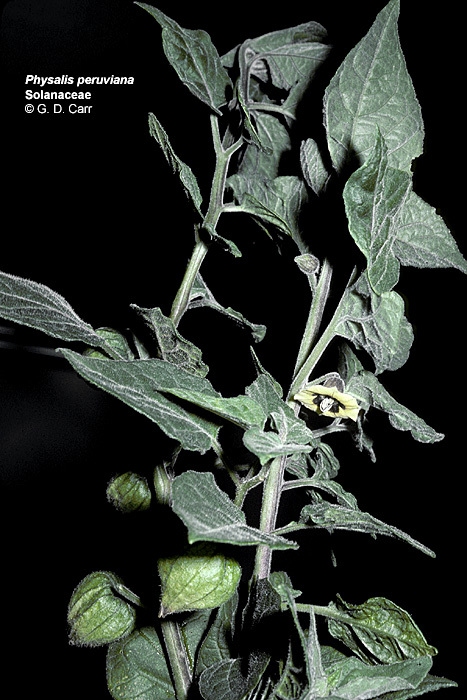 Nicotiana glauca, wild tobacco, tree tobacco. 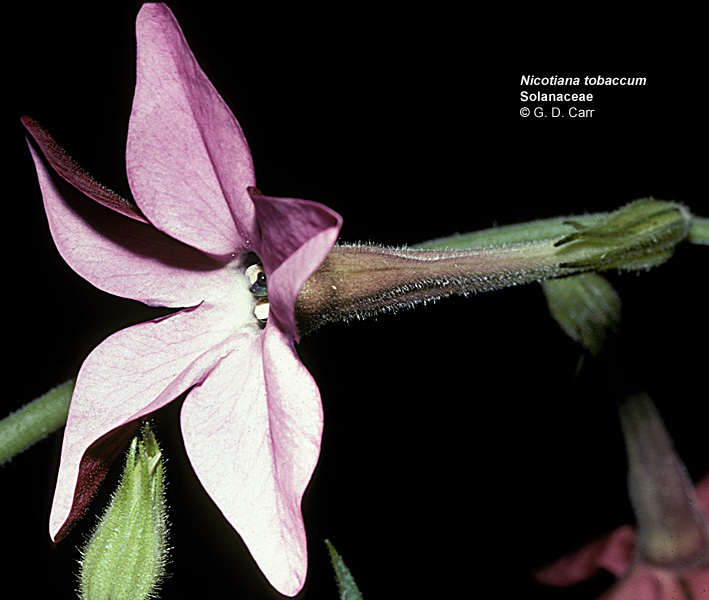 Nicotiana tobaccum, tobacco. 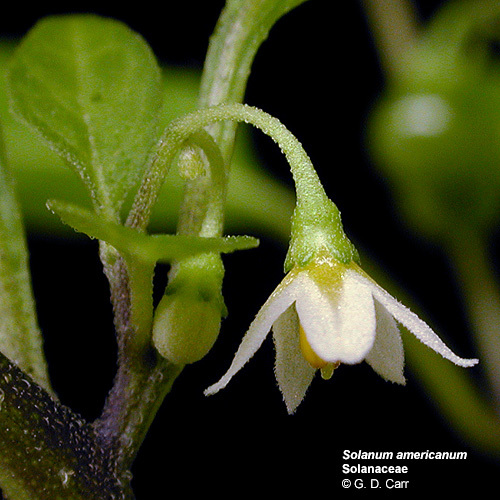 This species has a corolla with a long, narrow tube. 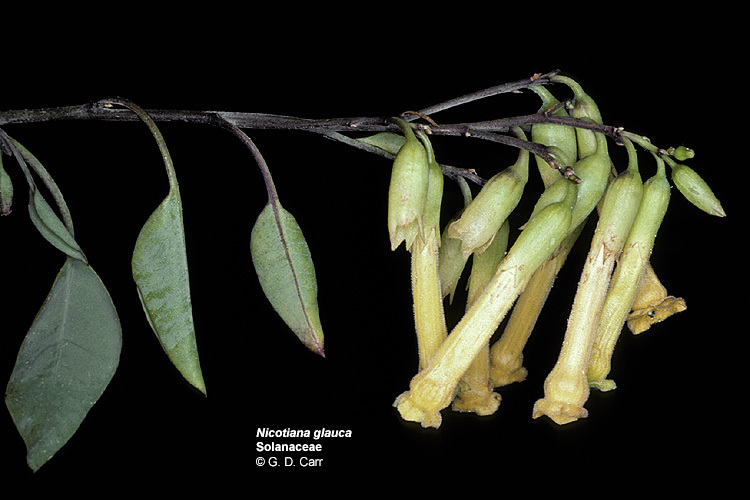 Nothocestrum latifolium, 'aiea. 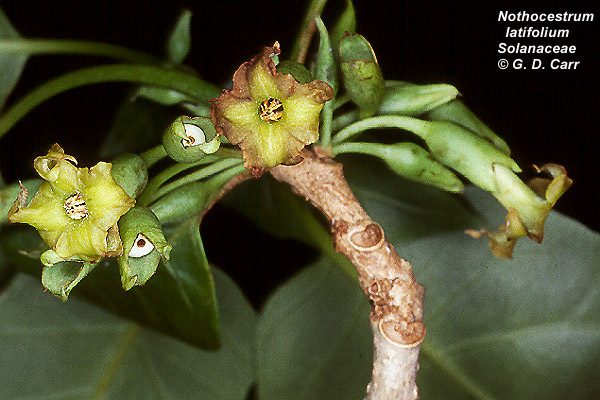 This native Hawaiian tree has 4-merous flowers. 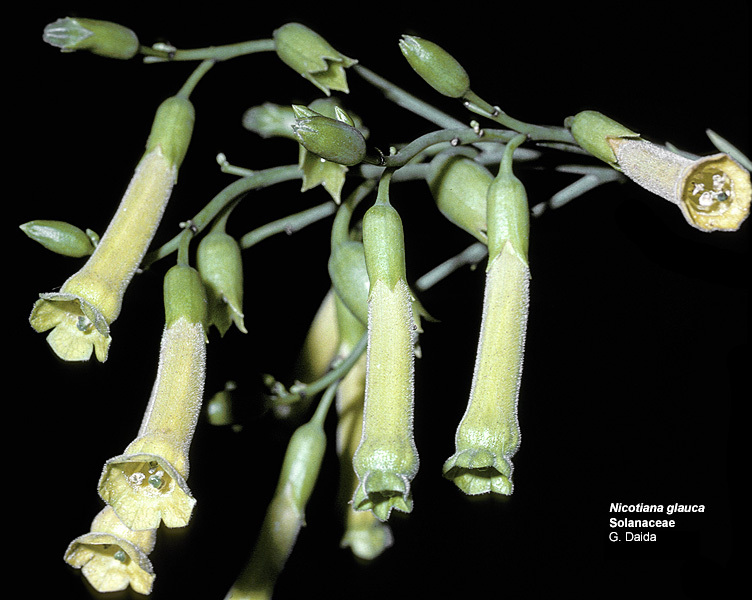 Note the conspicuous corolla and calyx tubes. 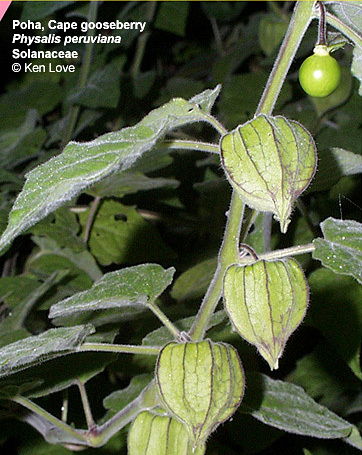 Physalis peruviana, poha. 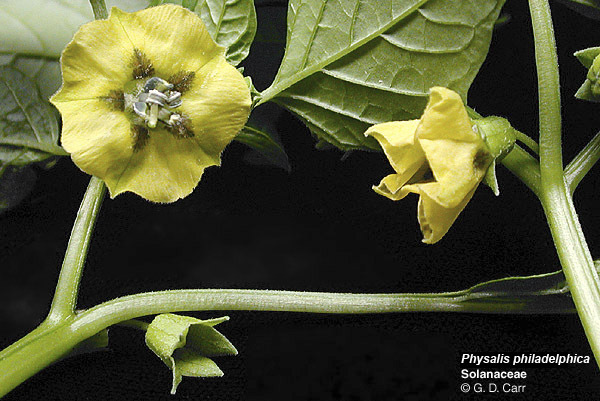 In some members of the potato family the flowers are rotate with very short lobes, very similar to the floral form in the related family, Convolvulaceae. 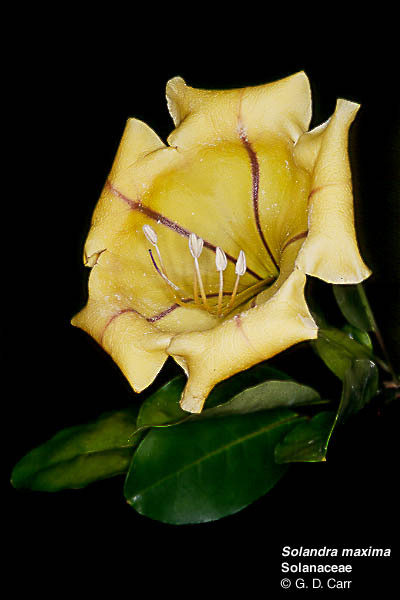 Solandra maxima, 'cup of gold,' a species with very large flowers measuring 5-6 inches or more across. 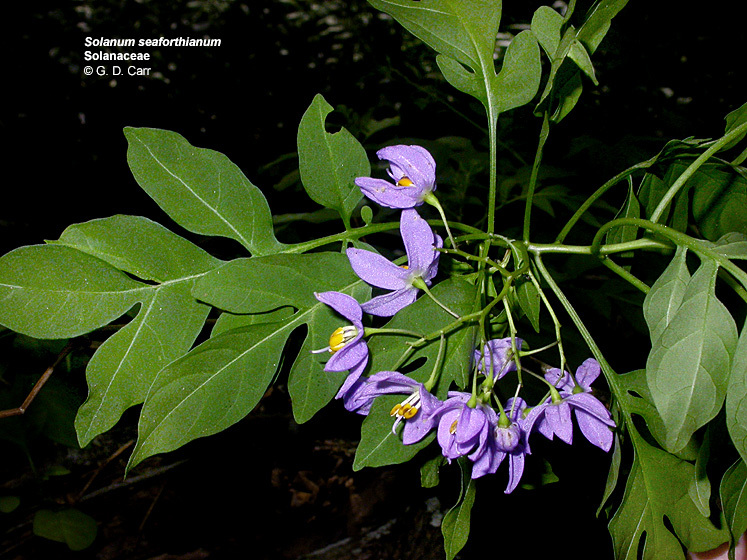 Solanum americanum, glossy nightshade, popolo. 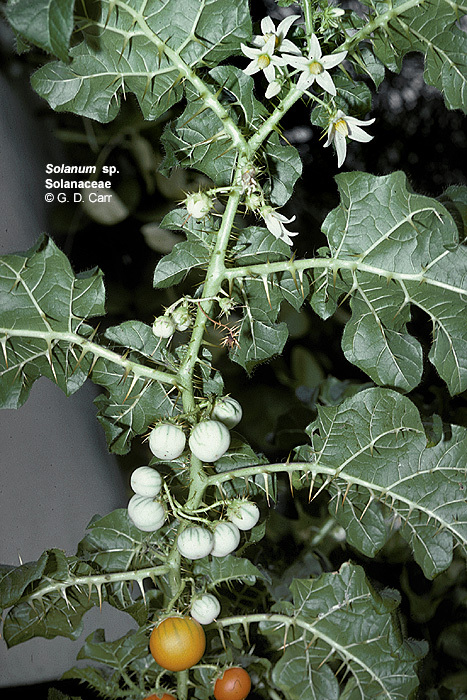 Solanum dulcamara, deadly nightshade. 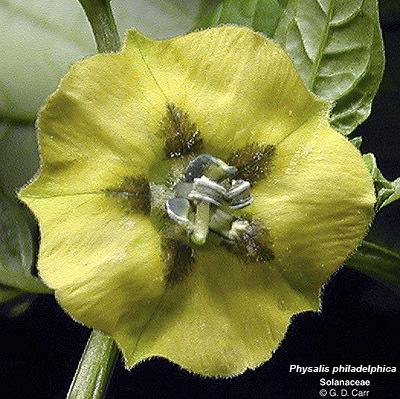 Members of the family with deeply cleft corolla and spreading to reflexed lobes such as this one often have anthers that dehisce poricidally. 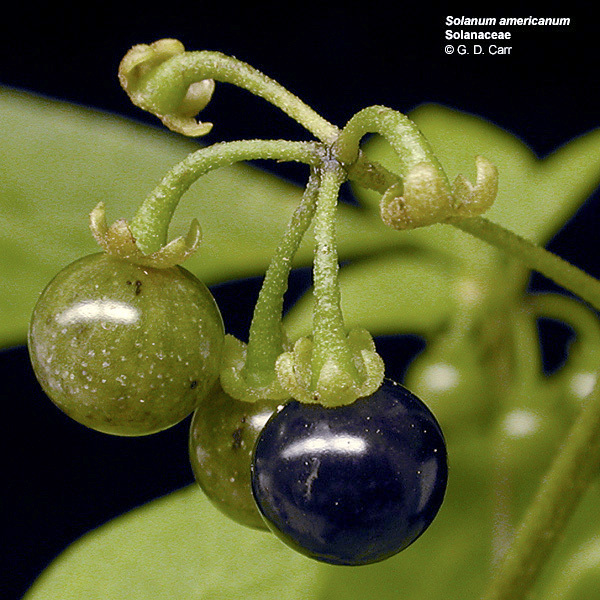 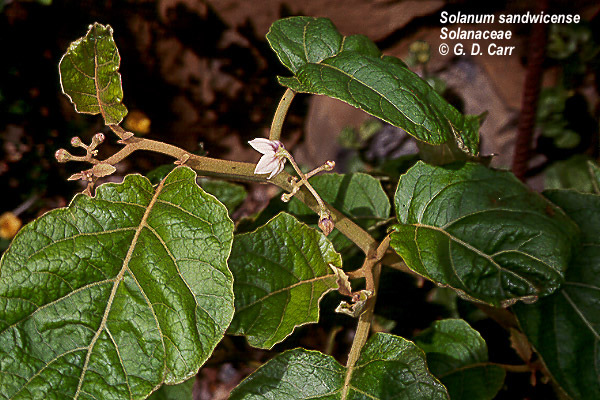 Solanum sandwicense, nightshade, popolo'aiakeakua, popolo, endemic Hawaiian species. 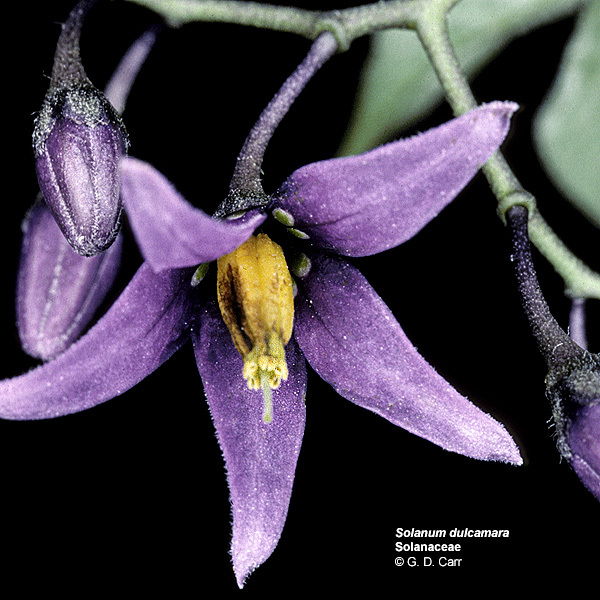 Solanum seaforthianum, Kaneohe, HI, December, 2004. 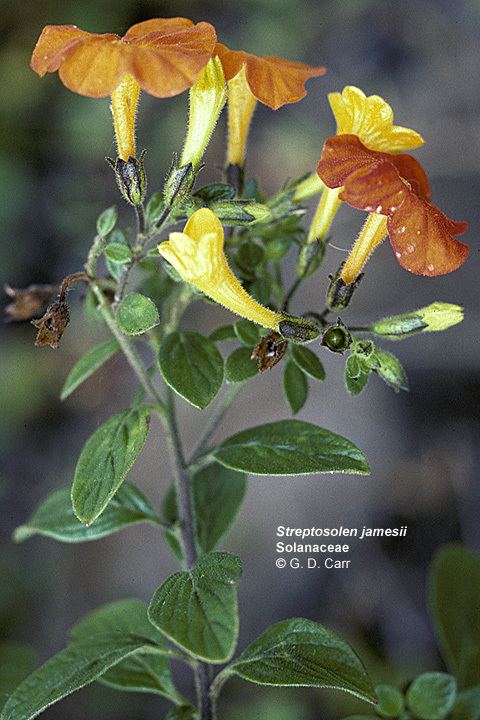 Streptosolen jamesii. 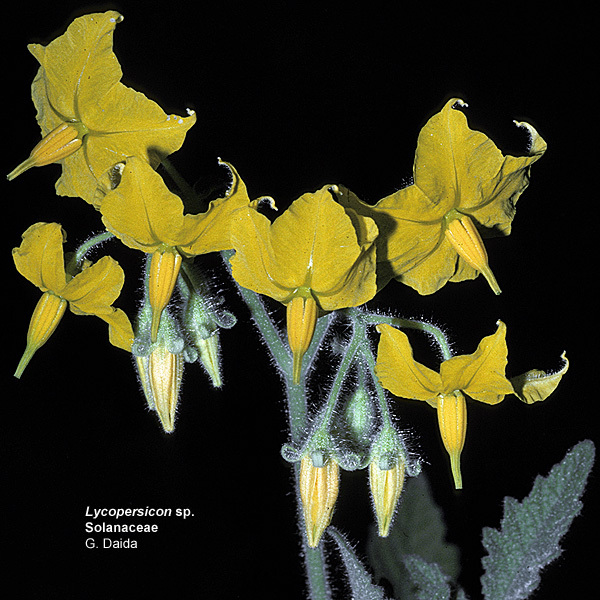 Note calyx and corolla typical for the family. 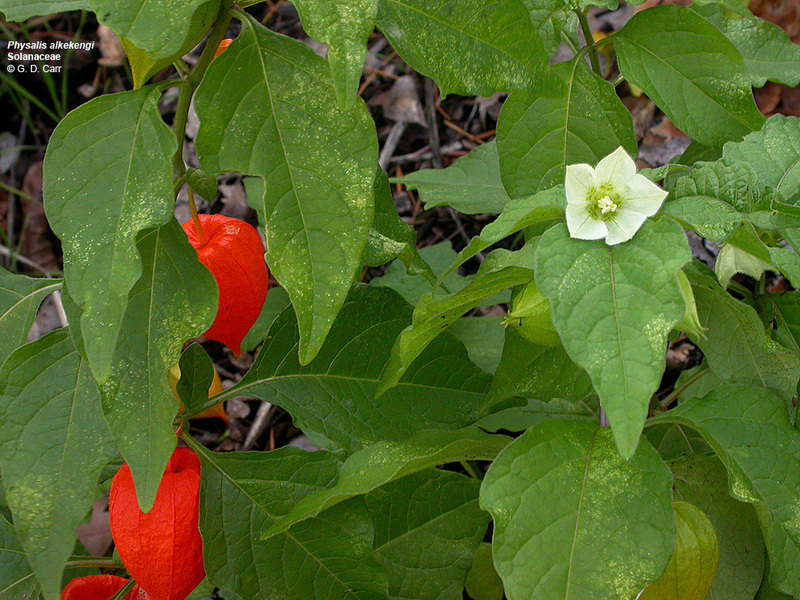 Note also the alternate leaves that characterizes the family.